This stunning one-of-a-kind semi-detached is located in the highly desirable “Vellore Village” neighbourhood of Vaughan, just steps from all amenities and minutes from most major highways. Perfectly positioned on the safe, child-friendly section of the street with minimal traffic, optimally situated on one of the largest pie-shaped lots in the area, and blissfully backing onto Komura Park with virtually no neighbours to the rear, this ultra premium location simply cannot get any better as it offers unparalleled value. Featuring loads of upgrades throughout, with modern décor and neutral tones, and offering a finished basement that puts the total living space at just over twenty-one hundred square feet, this one has it all. Having been meticulously maintained and well-kept with true ownership pride, this property is completely spotless from top-to-bottom, and absolutely move-in ready today with nothing left to do but unpack and enjoy. Don’t miss out on this exceptional opportunity! From the moment you first walk up the elegant stamped concrete entryway, towards the welcoming porch, through the grand double-door main entrance, into the lofty open foyer area, you instantly begin to feel like you’re at home. At that point, the property’s extremely functional floor plan is immediately acknowledged, as not one square inch of space has gone to waste. The home showcases many upgrades throughout including hardwood floors, pot lights both inside and out, coffered ceilings in the living/dining areas, plus much more. The flawless open concept kitchen features a custom subway tile backsplash, stainless steel appliances, an extended pantry, a walkout to the matching stamped concrete patio and oversized backyard, and this list just goes on. 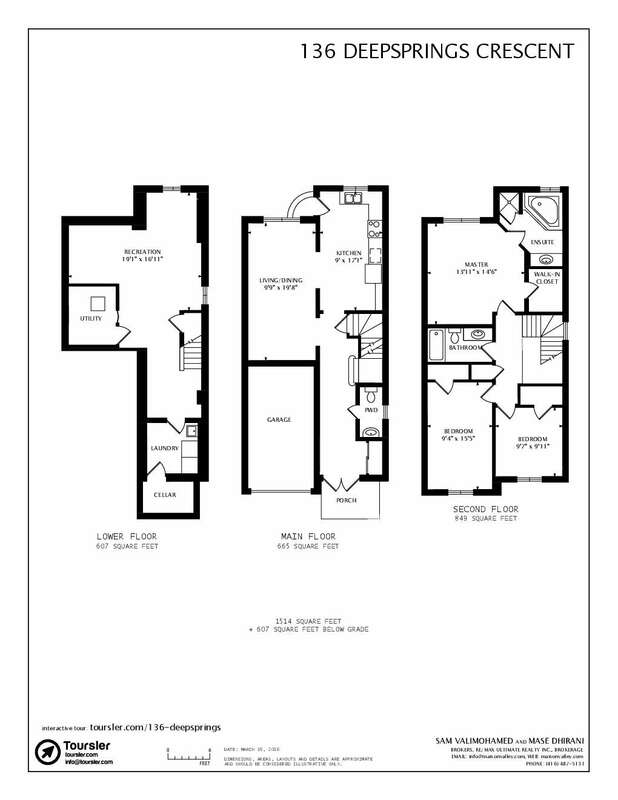 As you make your way up towards the second level, you’ll find three sizable bedrooms, including the master retreat, which features a four-piece ensuite and spacious walk-in closet. Each additional bedroom is more than ample in size, featuring wide closets and large windows. Down to the finished basement recreational/office space, which showcases matching laminate floors (that has kept the tone of the entire property consistent throughout), pot lights, tons of storage compartments for maximum stowing capabilities, a separate room with a three-piece rough-in (ready for the addition of the perfect downstairs bathroom by the new owner), and more. This rare find is not to be missed: so don’t delay, make your move today!